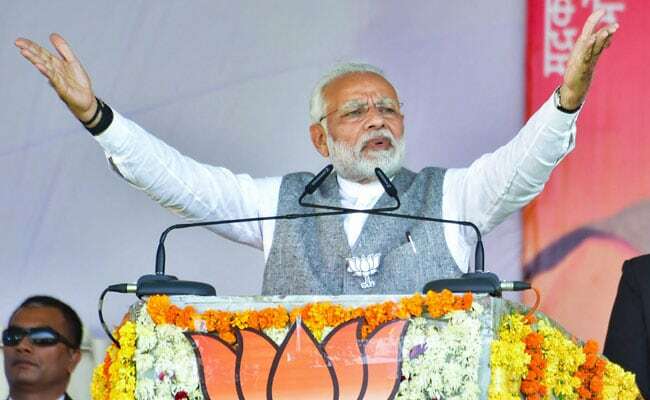 Were not those who promised to eradicate poverty "liars", Prime Minister Narendra Modi said in a blistering attack on the Nehru-Gandhi family at a rally here ahead November 28 Assembly elections in Madhya Pradesh. Prime Minister Narendra Modi targeted former prime minister Indira Gandhi on Saturday, saying her famous slogan 'garibi hatao' was a "false promise" and bank nationalisation was a "fraud" in the name of the poor. Were not those who promised to eradicate poverty "liars", he said in a blistering attack on the Nehru-Gandhi family at a rally in Mandsaur ahead November 28 assembly elections in Madhya Pradesh. He also said if he gets half the time the Congress spent in power, he would bring about a transformation in the country. PM Modi's remarks came in the wake of Congress president Rahul Gandhi's constant criticism that the BJP made "false promises" to the people in the run up to the 2014 polls. PM Modi said the four generations of the Nehru-Gandhi family ruled the country, but did not waste a single opportunity to "hoodwink" the people. "Grandmother of the 'Namdar' (dynast), Shrimati Indira Gandhi, was prime minister of the country. Didn't she give the slogan of removing poverty 40 years ago?" he asked the gathering. "Tell me honestly, has poverty been eradicated? Wasn't this a false promise? Weren't those who made the promise liars?" PM Modi asked. The Prime Minister said that Indira Gandhi nationalised the banks "overnight" claiming that her government was opening their doors for the poor. However, despite the nationalisation, half the people in the country had not seen the doors of the banks till 2014, he claimed. "Wasn't it (nationalisation of banks) a fraud in the name of the poor?" he asked. It was only after his government came up with the Pradhan Mantri Jan Dhan Yojana that the poor got access to the banking system, he said. "It is true that we need some time to correct mistakes of five-six decades. I have got just four years. Even if I get half the time they (Congress governments) had, I will bring about a drastic change," the Prime Minister said. Indira Gandhi had given 'Garibi Hatao, Desh Bachao' (remove poverty, save the nation) slogan during the 1971 general election campaign. Before that, in 1969, her government had nationalised 14 commercial banks.